Between Thursday 13 June and Friday 14 June 2018, you get Sticky Password, with a one year Premium licence, worth $29.99, for free. Sticky Password is a suite of products for mobile and desktop that allow you to store your online passwords, form fills and credit card information securely – our giveaway will give you access to all its Premium features across all supported devices, including Windows, Mac, iOS and Android. The most effective way of protecting yourself online – and limiting any damage that may come from hacked websites – is to use unique passwords for each site. Generating these by hand is time-consuming and impossible to remember, which is where Sticky Password comes in. 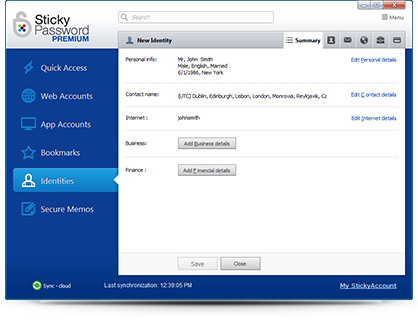 Sticky Password offers all the features you’d expect from a secure online password manager: it stores all of your passwords using AES-256 encryption, locked away behind a single master password (the only one you need to remember going forward) that isn’t known to anyone else. It can generate strong, random passwords using a mixture of letters, numbers and special characters automatically, plus has built-in form filling and secure credit card input for speedy checkout. All of this can be found elsewhere, but Sticky Password can also be used across mobile and PC/Mac without having to purchase a subscription. You also get biometric support on devices with fingerprint scanners. The free version is compelling enough, then, but look what a Premium subscription gives you: the ability to cloud sync your passwords across devices as well as an option cloud backup should you lose a device. You can also sync passwords across devices only using your Wi-Fi network for additional security – however you want to sync (manually, cloud or Wi-Fi only), Sticky Password puts you in control. And that’s where we come in with our final freebie – a year’s Premium subscription, so give your online security and privacy a much-needed upgrade. This promo has expired. Click here to see Today's offer! Sorry, but this Giveaway has either ended early as we've run out of codes (we only have a limited run and this offer is available to the entire world) or ended automatically as it came to the end of it's timed run. Check back tomorrow or another time for a new Giveaway and remember to grab the Downloadcrew Update Scanner tool and find the latest Giveaway news, software information, downloads and store offers! Simply login (create an account if you haven't done previously) and click the "get serial code" button. You should be allocated a serial code immediately. Note that you must activate your Sticky Password Premium license by August 31 2018. Special Offer: Move up to the Lifetime Edition - save 74%! We hope you are impressed with Sticky Password. Your license gives you a year-long Premium edition, but you can move across to an unlimited 'lifetime' edition which will never expire or need renewing. Better still, you can upgrade for only £25.99, saving a staggering 74% off the RRP! To move to the Lifetime edition, simply go to the Sticky Password website. Support for this free Giveaway is neither available from BetaNews or the Manufacturer. Please use the comment system below for help. We will reply to request for help in the comments.